The yellow warbler is a small, plump, bright yellow bird with a short tail. Its wings are olive-coloured and streaked with yellow. The male has distinctive orange-red streaking on its breast and belly; this streaking is duller or absent in the female and absent in juveniles. This species is generally found in wet habitats, especially in willows and alders. It winters in South and Central America, migrating across the southern United States and spending summer across nearly all of North America except northeastern Canada. It can be found on the Central Coast in the summer breeding months. 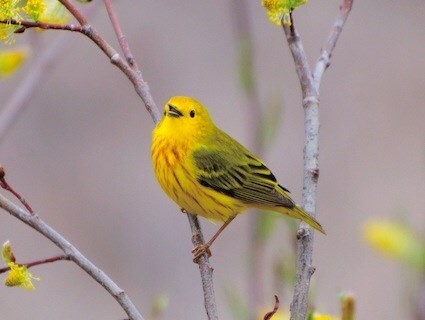 The yellow warbler is very similar to Wilson's warbler, also found on the Central Coast in the summer months. Male Wilson's warblers are easily identified by their black cap, but females and juveniles have faint or no caps. Wilson's warblers do not have any reddish streaking on their undersides, and their wings are more olive, with little or no yellow streaking. 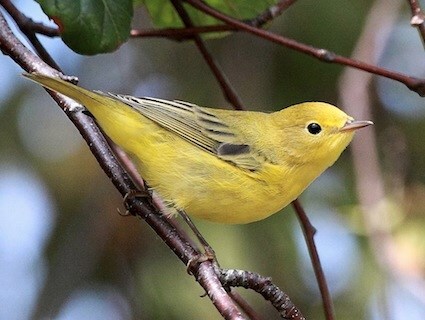 Other species that may be confused with the yellow warbler are the American goldfinch, the common yellowthroat, and the orange-crowned warbler (Vermivora celata). 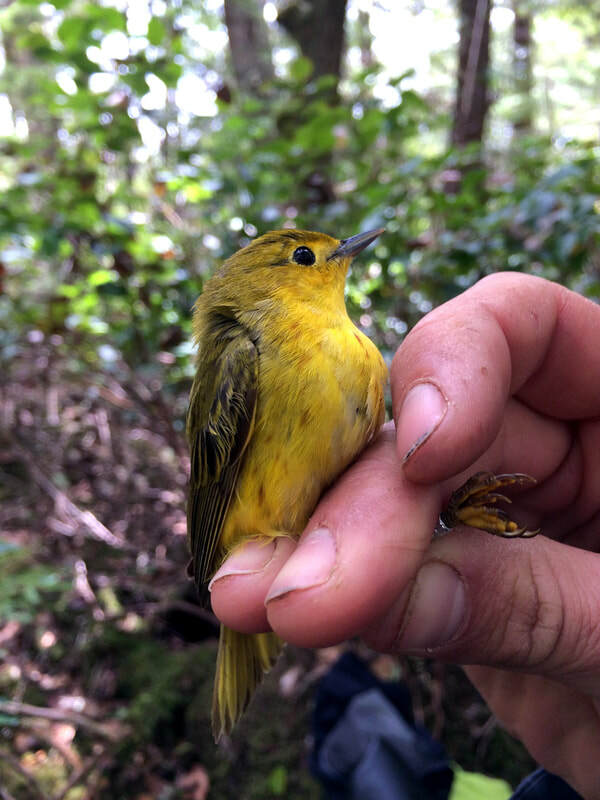 The yellow warbler has less markings than these species. The yellow warbler is often targeted by the brown-headed cowbird, a parasitic species that lays its eggs in the nests of other birds instead of building its own. These unsuspecting birds will raise the brown-headed cowbird chicks as their own, often at considerable cost to their own young. The brown-headed cowbird may be found in the southern part of the Central Coast, at the northern extent of its range. Brown-headed Cowbird. Molothrus ater. The Birds of North America Online (A. Poole, Ed.). Ithaca: Cornell Lab of Ornithology; Retrieved from the Birds of North America Online. Accessed 16/03/2013. Dunn, J. L. and Alderfer, J. (Eds.). (2006). National Geographic Field Guide to the Birds of North America. (5th Ed.). Washington, D.C.: National Geographic Society. Pp. 390-391. Varied Thrush, Ixoreus naevius. The Birds of North America Online (A. Poole, Ed.). Ithaca: Cornell Lab of Ornithology; Retrieved from the Birds of North America Online. Accessed 16/03/2013. Chanda Brietzke and Brian Starzomski (2013).